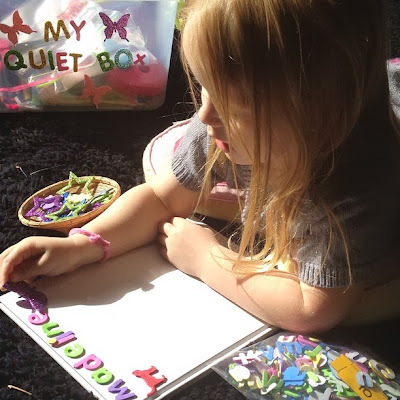 Learn with Play at Home: Quiet Box. Independent Activities for Kids. Quiet Box. Independent Activities for Kids. Back when my daughter was a bit younger, we made her a fun "Busy Box" full of things that she was able to manage independently. As she's grown older, her Busy Box was old news so it was time for me to come up with something new to capture her interest once again. Now as a preschooler, her ability to spend longer periods of time engaged independently has increased, so having something on hand to pull out when needed is very convenient. This time we called it our "Quiet Box." 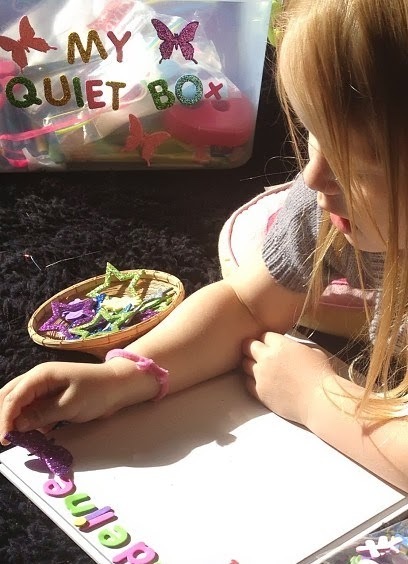 A "Quiet Box" is great to have on hand for when your child needs to be entertained and engaged independently. This could be because the child needs a bit of quiet time, a bit of time out from certain situations, a distraction or a refocus, or because the adults really need a few minutes to make that phone call or the other million things that need to be done in a day. Materials that can be used independently. Your child should not need assistance with any of the contents. eg. If they need help cutting, don't put in scissors. Things that can be used quietly. We have tons of things that make noise, this particular box is not the place for recorders, beeping games etc. Things that are open ended. 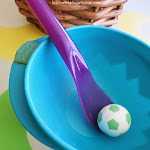 This means they have more than one use or that the child can use it in more than one way. Pretty much anything creative will be open ended. Things that allow my child to learn and be creative. Who doesn't want that? Below are the specific items that are currently in Maddie's (aged 4) Quiet Box. I also included 4 different "Busy Bags" These are great because each can be used on it's own or the materials used together for different creations and experiences. 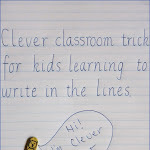 As they are open ended it means there is no right or wrong way for the children to use the materials. This helps with their creativity. Foam people with foam shapes for clothes etc. Each bag can be used independently but they also include materials that can work well and be used with any of the other materials in the box. A few purchased materials that I take travelling with a us. 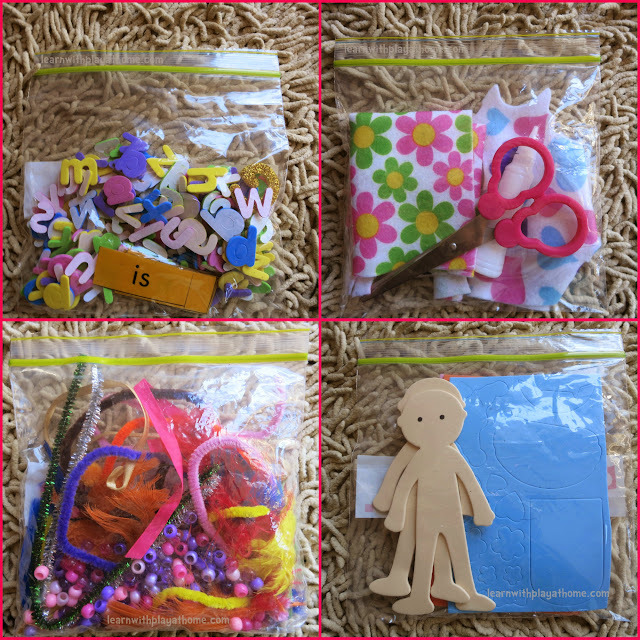 An "I spy bag" (Childhood 101 show us how we could make our own DIY Travel Peekaboo Game) and a little set of stamps with pad for storytelling. And lastly, the teacher in me just couldn't help having some number related materials in there so there is also a Jumbo set of Playing Cards and a calculator. The first thing she did when she was given her Quiet Box for the first time was to lay in the sun and use the letter stickers out of the busy bag to spell out her name on her blank drawing book and to add decorations. - Think about your child's interests. What do they enjoy doing?, What are they interested it?, and try to include some materials that touch on these. 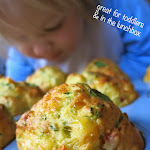 - When my daughter was a toddler I wrote about our Busy Box. It's essentially the same as our Quiet box but with different materials. By reinventing the name for her and starting with new, fresh materials, she was able to be excited once again by the same concept. 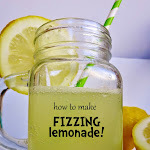 If you'd like to see what we had in our Busy Box you can see the post here. Do you have a similar strategy at your house for quiet, independent play? We'd love to hear about it. Such a sensational idea. Great for children who are also dealing with anger issues I think. Love this post. Thanks for sharing and I look forward to putting one together for my little girl. It's funny how we do thing with one child and then forget about it for the next. We actually did this ages ago with a busy box and after probably 6 months use, we forgot about it. Not sure how, haha. Life! This is a great box of quiet time fun! I remember my grandma had a draw full of things like this when I was a kid, so I've done a draw too... actually she was a primary school teacher too - you teachers have the best ideas! Love this idea Deb...i really need to set up a different one for each of the twins as they like such different things and nap time is becoming abit sporadic...love those gorgeous pics of concentration too! Thanks Jode. Making 2 would be a good idea because then if they get bored, you could swap! haha. I just love all these great ideas! These will be perfect for my 4-year-old!